It's show time for the man they call 'Monster'. 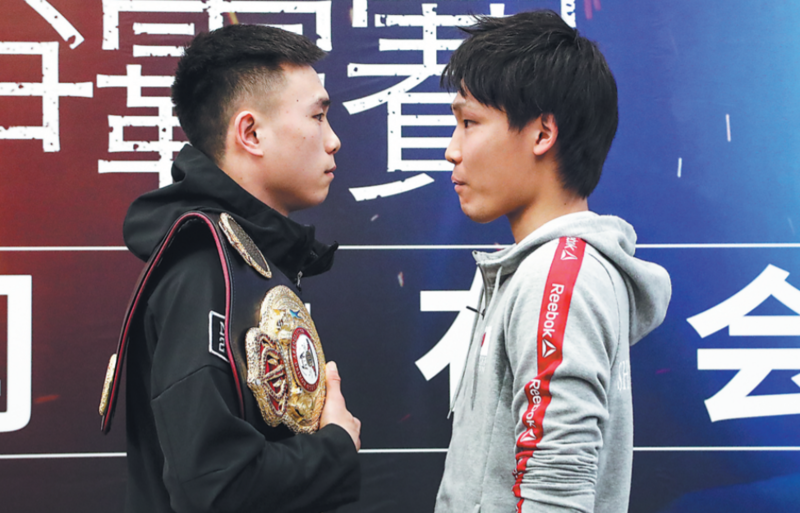 Xu Can, China's reigning World Boxing Association featherweight champion, is vowing to take a giant stride toward unifying the fragmented title with a strong defense against southpaw Japanese challenger Shun Kubo on May 26 in Xu's hometown of Fuzhou, Jiangxi province. If the actual punches match the hostility of their war of words, fight fans are in for a treat. Ahead of what will be Xu's first defense since wresting the crown from Puerto Rico's Jesus Rojas in Houston, Texas, in January, Kubo, the former WBA super bantamweight champ, wasted little time in tossing some verbal bombs at a Beijing media conference to announce the fight. "I don't care (about having to fight in his hometown), it will be me who brings the belt back to Japan," Kubo said on Friday at the capital's M23 boxing club, where Xu trains. The champ didn't take the bait. "He's talking nonsense. That's impossible," responded the 25-year-old Xu, who goes by the ring moniker Monster. "I'm not going to allow anyone to take that belt out of my house. He might be a tough fighter and a strong challenger, but it's me who is hungrier. "It's more satisfying to prove I own the title by successfully defending it than by winning it the first time." The featherweight (126 pounds) champions of the other three major sanctioning organizations are Garry Russell of the US (WBC), Josh Warrington of Britain (IBF) and Oscar Valdez of Mexico (WBO). By defeating Rojas via a 12-round unanimous decision, Xu improved to 16-2(2 KOs) en route to becoming the third Chinese to win a professional world title, following pintsized puncher Xiong Chaozhong (former WBC strawweight champ) and two-time Olympic gold medalist Zou Shiming (ex-WBO flyweight titleholder). With Xiong and Zou now retired, Xu has emerged as the face of pro boxing in China, an honor that fuels his deceptively quick and accurate technique. "My advantage against any opponent is speed and range, but it's the same case for Kubo as he is similar to me in size," said the 5-foot-9 Xu, who fights for Beijing-based Max Power Promotions. "I will have to make my attack more lethal and make each punch count so I can dictate the pace." To prepare for Kubo, a 29-year-old lefty, Xu will work with heavier Filipino sparring partners, according to Liu Gang, Xu's promoter with Max Power. "Xu is in good shape since winning the title. The key for him is to get used to the range and power of Kubo while staying healthy and mentally fresh," said Liu. Born in remote Zixi county in Fuzhou, Xu started boxing at 14, supported by pastry-making parents who traveled with him across the country to settle in Kunming, Yunnan province, the cradle of Chinese boxing. Xu's talent and potential caught the eye of matchmakers at Oscar De La Hoya's Las Vegas-based Golden Boy Promotions, which signed a contract with Max Power at the end of 2017 to jointly promote Xu overseas. Kubo (13-1, 9 KOs) won the WBA super bantamweight title with an 11-round technical decision over Panama's Nehomar Cermeno in Tokyo in April 2017, but lost it to American challenger Daniel Roman in his first defense five months later. Kubo moved up to featherweight last year and defeated Hiroshige Osawa, the WBA's former No 1 contender, in a split decision. "To win a second WBA title in a different weight class is a strong motivation. In the next five weeks we will study film of Xu's previous fights to prepare Kubo to the best he can be," said Yamashita Masato, the challenger's promoter. In the co-main event on the sixbout Fuzhou card, M23's Sho Kimura (18-2-2, 11 KOs) of Japan will challenge WBA light flyweight titleholder Carlos Canizales (21-1, 17KOs) of Venezuela. Kimura made his name in China by stopping Zou in 11 rounds in Shanghai in July 2017, to win the WBO flyweight title. He lost it to compatriot Kosei Tanaka last fall. In the featured prelim, Chinese flyweight Wulan Tuolehazi (11-3-1, 5 KOs) will make his first defense of the WBA International crown against an as-yet-unsigned challenger. Wulan won the vacant title with a unanimous decision over previously unbeaten Japanese Ryota Yamauchi (4-1) in Shanghai last month. Inspired by Xu, more young boxers from China are aiming to punch their way onto the world stage, and M23 will facilitate that ambition, said Liu. "The mission at M23 is to produce at least five more Chinese champions by 2023. We will work more with the international community and bring more Chinese fighters to the US because that is the world's largest boxing market," the promoter added.